Juice cleansing enables your body to detoxify more efficiently. Digestion requires a lot of energy and by removing the fiber and drinking only the juice we give our digestive system and organs a ‘break’. This frees up energy that can now be used to detoxify, cleanse and heal, while flooding the body with an abundance of nutrients and enzymes. 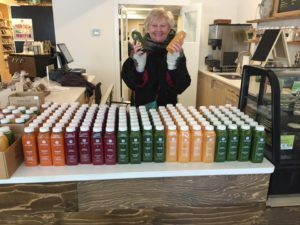 If you would like to know more details on how to do a Juice Cleanse visit our FAQ’S page.Our raw, certified organic cold pressed juices are a perfect daily addition to a well rounded nutrient rich diet. With 3-6 lbs of fruits and vegetables pressed to create every bottle. No water added. PRE-BOOK A CLEANSE anytime in the month of May and Receive 10% off! Call the shop to book 403-347-1615 or order and pay online! Join Kristin Fraser with Inner Glow Nutrition, on her free 3 day juice feast coaching experience online. We are happy to provide you with your juices and Kristin will provide you with a free video training on how to get the most out of your juicing experience!